Many people take the “more is more” approach to their website’s navigation menu—the logic being that if visitors need to find something, at least they’ll be able to find it in the main menu. User experience: A short menu is easier and faster for people to read through—if they have to hunt through lots of options, they are more likely to bounce. Search engine optimization (SEO): A short, clear menu makes it easier for search engines to navigate, understand, and index your site. Design: A short, single-line navigation bar will keep your website looking sharp and is easy for visitors to read. Good to know: With Jimdo Dolphin, you’ll get a ready-made navigation menu with the right pages for your specific industry. All you have to do is customize it! Does your navigation need help? One way to assess your website is to simply count the number of menu items in your navigation. A good rule of thumb is to keep it to between three and six choices. Any more than that, and you may be stretching your readers’ attention spans. The good thing about Dolphin is: even if you have too many items are in your menu, your navigation won’t break into two lines. Dolphin automatically adds these into a drop-down menu instead to make it easy for your visitors to read. So what exactly should you consider when building your navigation? These tips can help. Does your website have a crowded navigation menu, like this? In the first example, there are 11 menu items in the navigation bar. As a reader, it’s hard (not to mention pretty boring) to scan through all of them when all you probably want is a cup of coffee. In the second example, we’ve streamlined the navigation based on the most important information visitors will probably be looking for when they come to our website. This helps our users and makes the website look much cleaner and more organized too. Will my menu look this good on all devices? Yes! Jimdo Dolphin automatically adjusts your navigation menu to fit any device (whether that’s a laptop, a tablet or a smartphone). On smaller mobile screens, your visitors will be able to find extra pages under the “More” tab. Good to know: If you’re having a hard time deciding what’s important, try splitting your website into a handful of easy-to-understand categories (subpages) that appear in your navigation. Use the main category in your navigation menu then let visitors pick a subpage from the drop-down menu (see Tip 3). This may not work for everyone, but if your navigation menu is just slightly over the limit, some simple wordsmithing might help. Keep the words you use in your menu relevant, accurate, and short. That way both humans and search engines will easily understand them. For example, it’s better to say “Contact” rather than “Get in touch with us”—both because it’s shorter, and it’s the standard language that people are looking for when they scan a page. This is a really easy way to fit more items in your navigation without clutter. In the example below, “Breakfast” and “Coffee & Tea” don’t really need their own space in the top navigation. They make sense nestled underneath “Menu.” You can turn a regular page into a subpage from the Pages menu. Some menu items might logically belong in a drop-down menu underneath your main pages. Tip 4: Cut, cut, cut! Some pages might not be necessary at all. 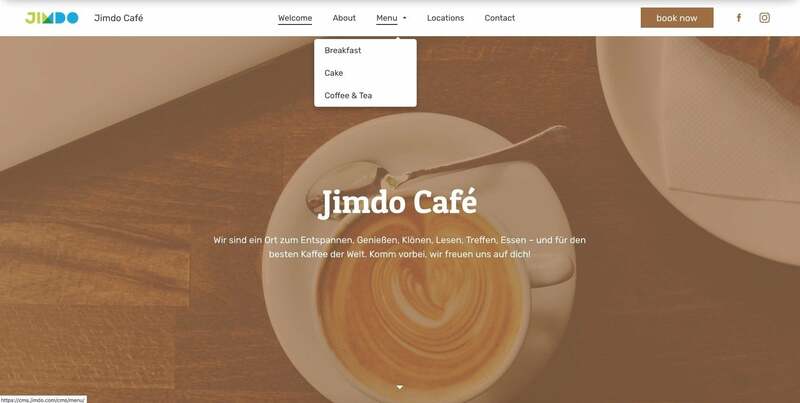 In our Jimdo Café example above, you may not need a separate page for maps—you could incorporate that information on your Locations page. The same goes for Opening Hours—since that’s info most people will want to find right away, you might just put your hours right on your homepage or add this text to your footer. If you need help thinking through which pages are the most important, check out this post on the three questions that will help you plan your website. If you take a critical eye to your navigation menu, you might find some pages that don’t really need to be there. You can turn them into subpages or move their info to another page. 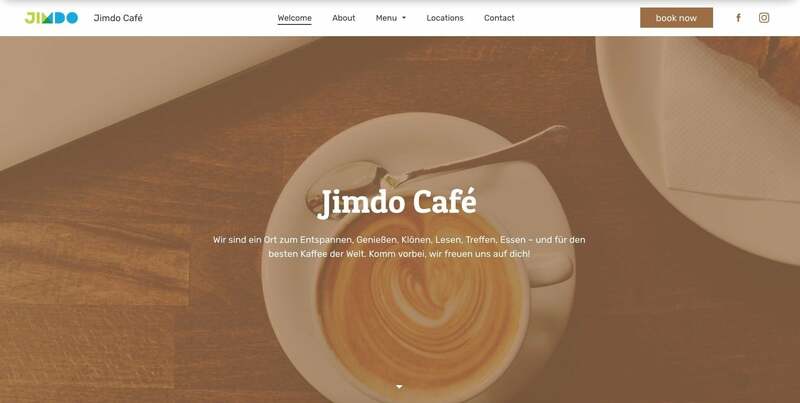 In true Jimdo-style, we’ve added loads of new features to help you convert visitors into customers. 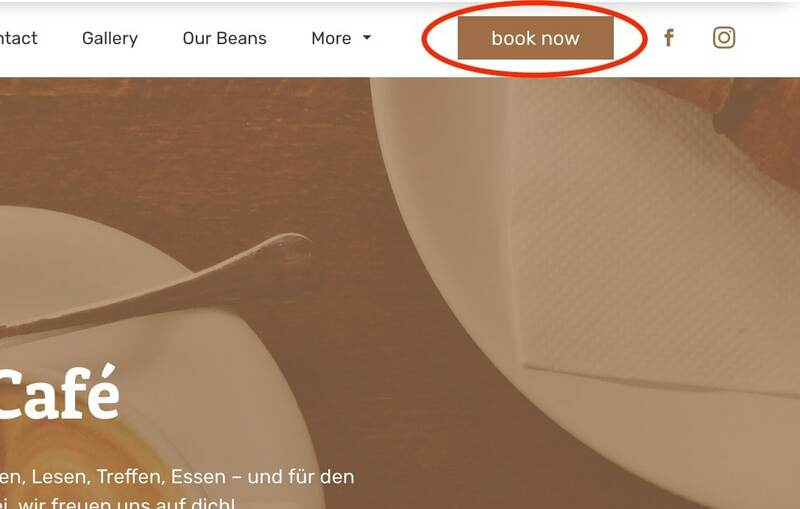 You can now add your own call-to-action button, like “Call Us” or “Book Now”, to your navigation bar—so it’s easy to guide your visitors where you want them to go. Think of your call-to-action button like a “shortcut” to the destination of your choice. You could use it to direct more visitors to your About page, get them to make a booking, or let them call you with just one tap. The navigation button is perfect for visitors to convert. When visitors look at your site on any device, they’ll always see your prominent call-to-action button. Then all it takes is a tap, and voila! You’ve converted a new customer. If you want to improve the flow and structure of your website, help people find what they are looking for, and simply make your site look better overall, some simple tweaks to your top navigation can really work wonders. Give it a try on your website and let us know how it goes!